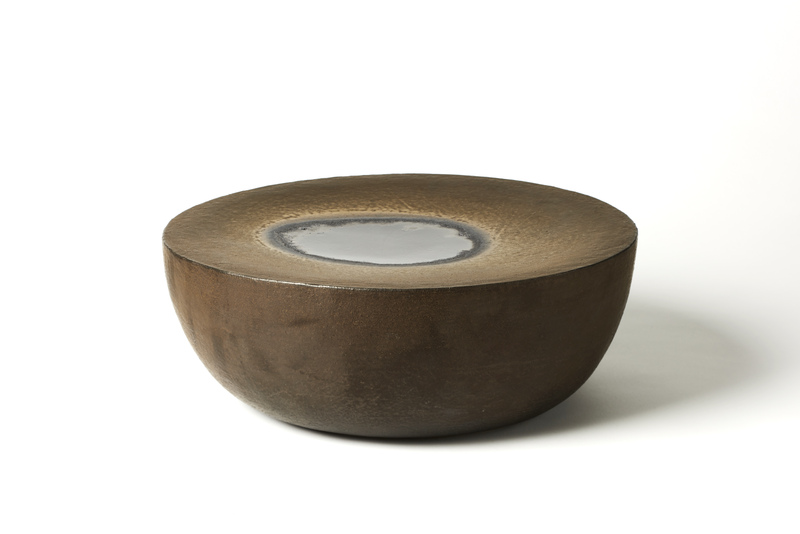 This piece was inspired by the natural landscape in Iceland. Hot bubbling puddles in the grey landscape with vivid edges where the vegetation flourishes. 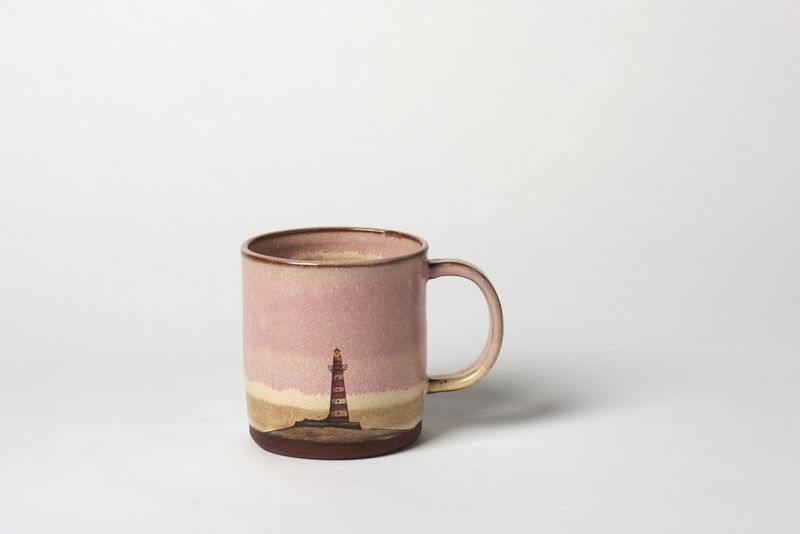 It was exhibited at 'Shift', a project organised by Emergents which brought together Scottish and Icelandic makers. 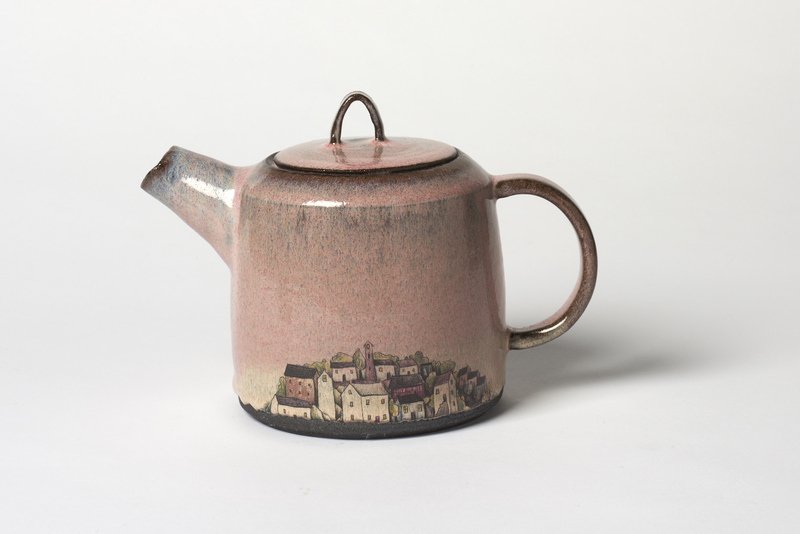 A simple functional teapot, thrown and hand modelled then double dipped with studio made glazes. The little village is reminiscent of coastal villages dotted along the Moray Firth. 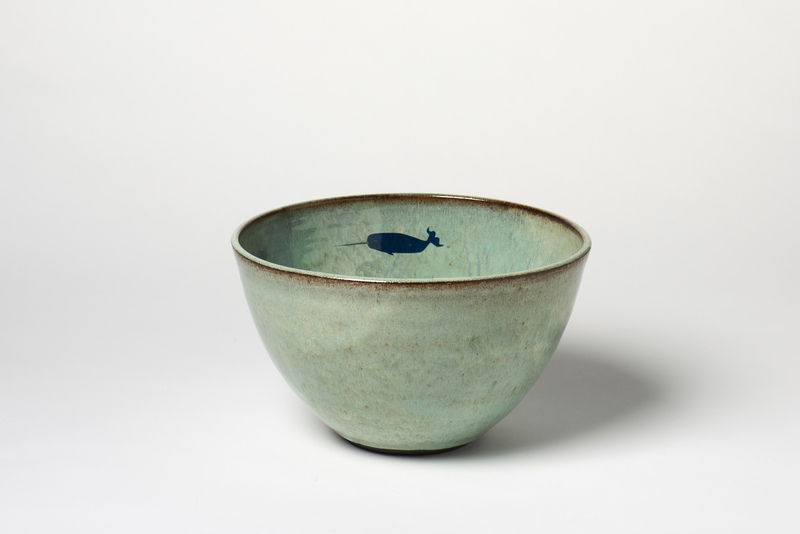 Hand thrown with black clay and glazed with three layers of colour to add depth and texture. My bestseller at Christmas 2018. 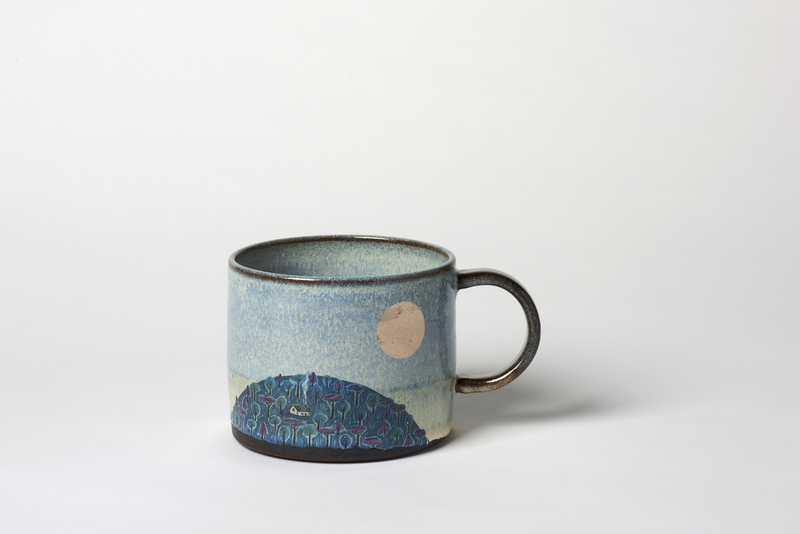 A simple form with detailed illustration featuring a cosy cottage in the woods overlooked by a large winter moon. Living by the sea I witness the ever-changing colours on the water and in the sky. Mostly blues and greys but not always. Porcelain lily pad plate with satin golden glaze and translucent green glass pools. 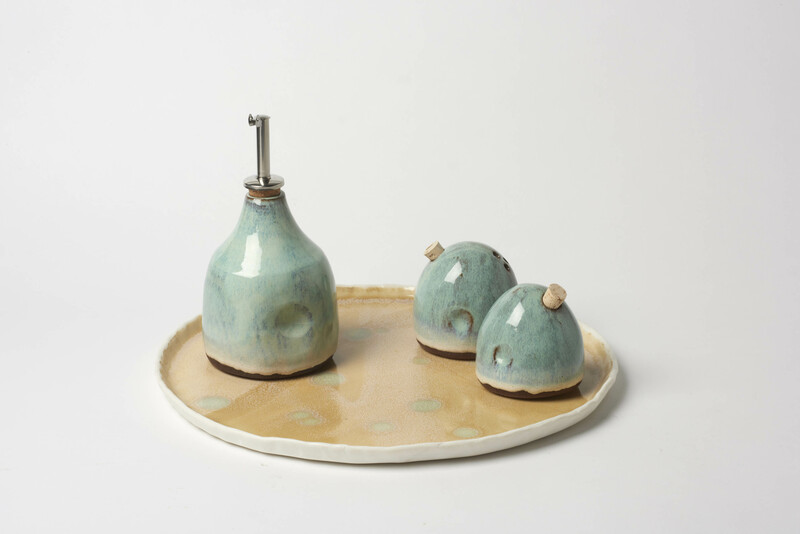 Smooth tactile salt and pepper pods and dimpled oil pourer pot. 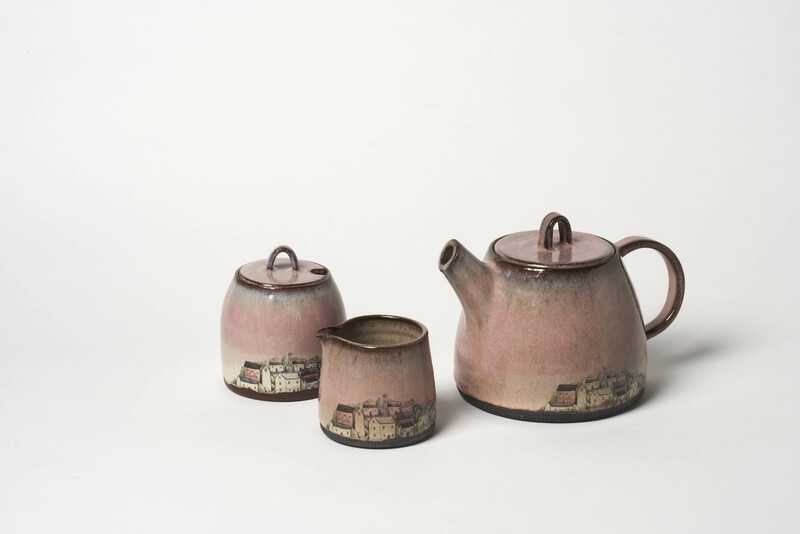 Dusty pink teapot, mini pourer and lidded sugar pot with hand drawn village print, reminiscent of the coastal villages dotted along the Moray Firth. 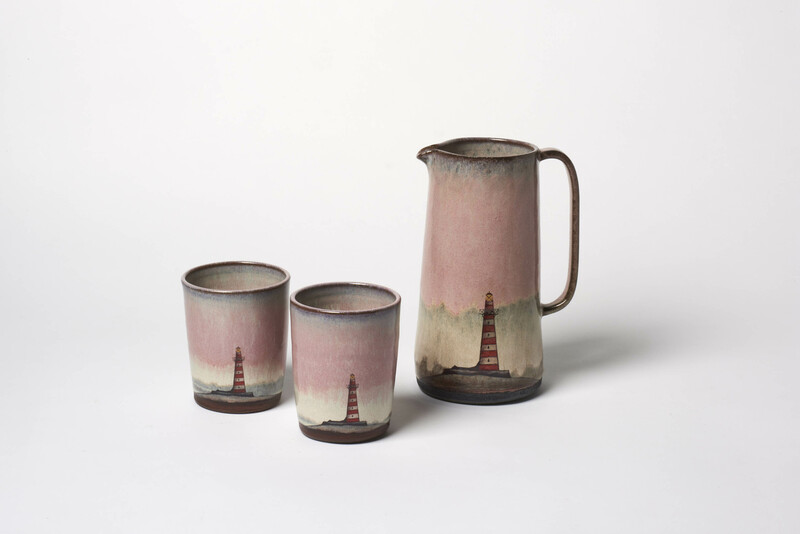 Tall pink water jug and cups with lighthouse print, originally drawn with coloured pencils. 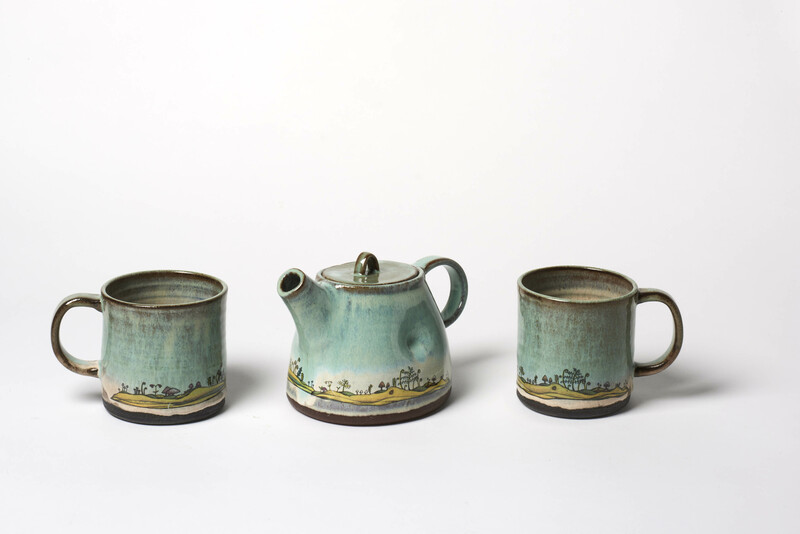 Distinctly handmade tea pot with matching green mugs. My forest floor illustration, inspired by ferns, mushrooms and moss at Cawdor Forest, is printed and fired on to the glossy glaze. 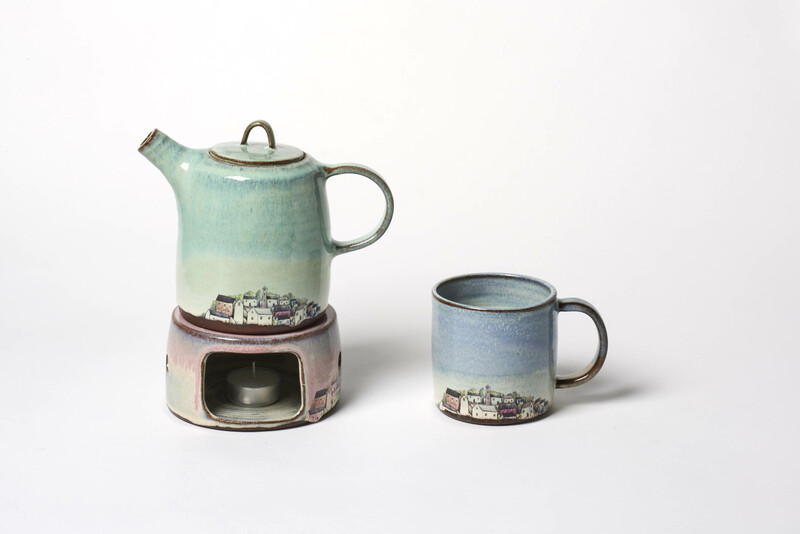 Thrown and hand modelled teapot, mug and cup/ tea pot warmer with hand drawn village print and layered glazes. 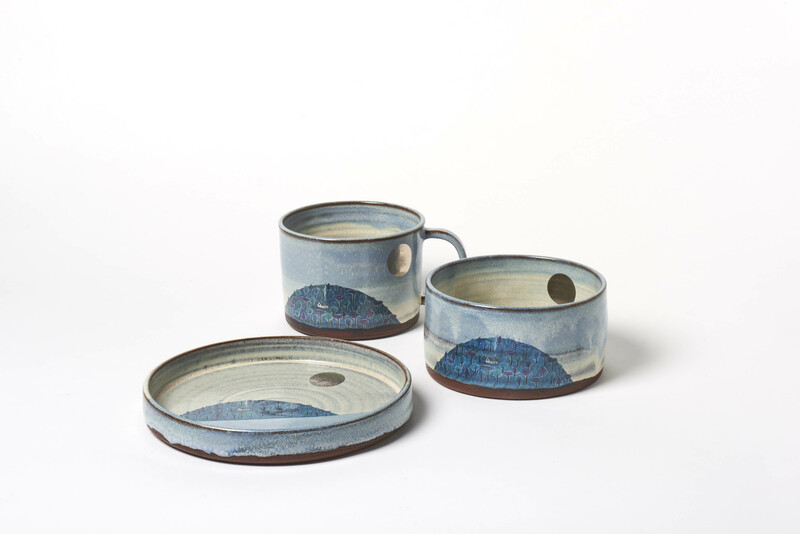 Matching plate, bowl and large breakfast mug with layered blue glazes, hand drawn hill illustration and silver lustre moon. 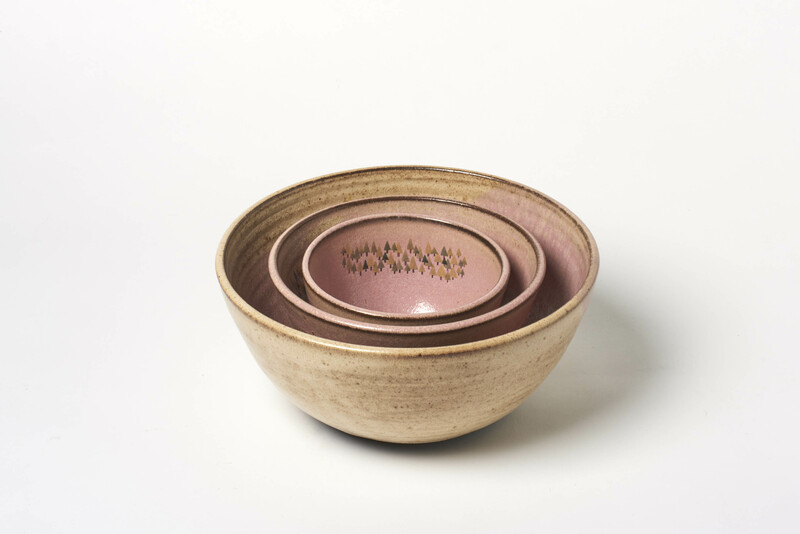 A versatile set of large, medium and small bowls with rustic tan and pink glazes and hand painted forest print. 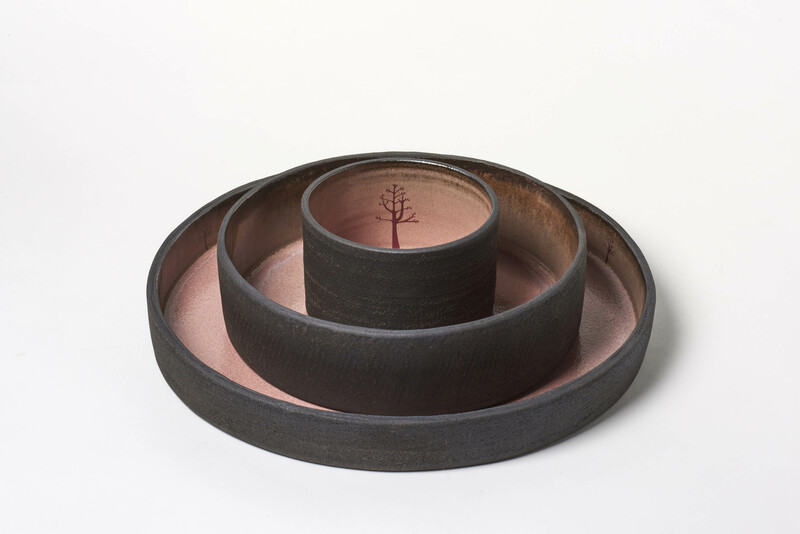 Three bowls hand built with black clay and decorated with contrasting smooth pink glazes and hand drawn winter tree illustrations. 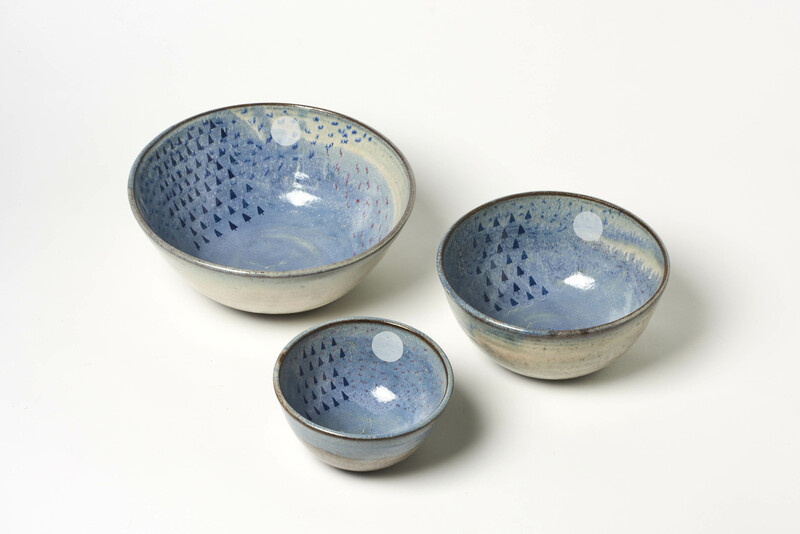 A versatile set of bowls with layered blue glazes, hand painted tree and white moon prints. 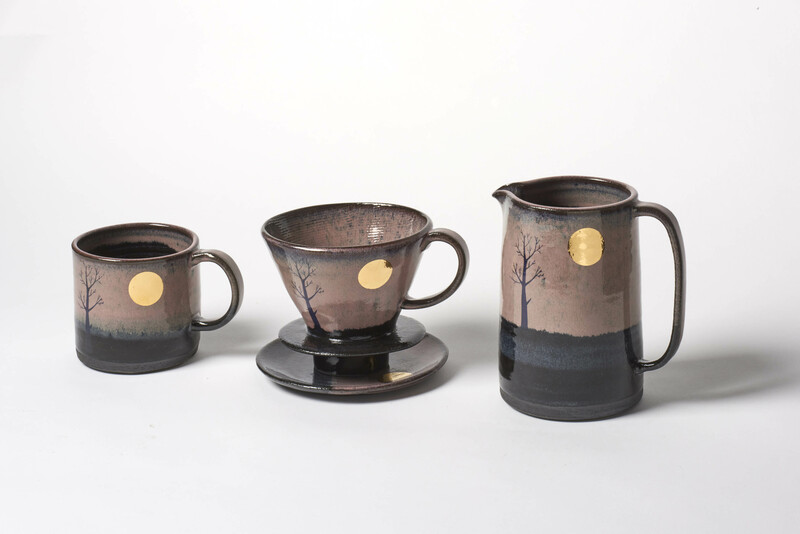 Coffee dropper with saucer, mug and matching jug made with black earthenware, layered pink and dark blue glazes and gold lustre moons.